"You’ll adore these muffled melodies and dolorous, drifting elegies." With much of the world blanketed in snow, now might be the perfect time to soak up a new release from Summer Heart, the solo project of Swedish singer-songwriter and multi-instrumentalist, David Alexander. Best known for a nostalgic low-fi sound, David’s sun- bleached latest track The Forbidden is just the thing for those pesky winter blues. 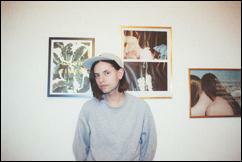 In this song, Summer Heart brilliantly uses a mix of vocals, guitar, synths, bass and drum machines in the song to create his signature variety of hazy, dream pop. With such an impressive blend of rhythms, tones and melodies, it’s hard to believe that there’s just one man behind the Summer Heart so artfully packaged sound. Summer Heart is a featured performer at this year’s SXSW festival in Austin from March 15-20. Additionally, you can catch Summer Heart play a much-anticipated show at Brooklyn’s famed Knitting Factory in New York on March 23. Taken from is forth-coming EP, the new single The Forbidden holds all those quirky attributes of David’s song-writing and production skills, and is out NOW.